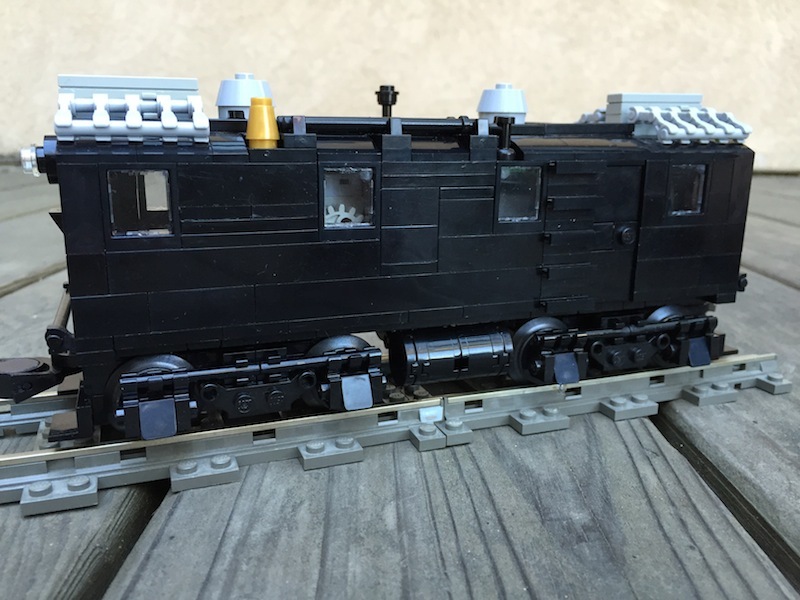 Somewhere between talking to CommanderWolf about boxcabs, seeing his HH1000, and reading up on old diesel-electric locomotives on the internet, I somehow got the idea to build a model of the very first production diesel-electric locomotives in the United States. These locomotives were produced by a consortium of three companies: ALCo, General Electric, and Ingersoll-Rand. Diminutive as they were (this model represents a 60-ton, 300hp locomotive), they are the direct ancestors of the diesel-electric locomotives powering the US rail system today. As far as I can tell, only three locomotives were actually built with this specific layout: CNJ #1000, B&O #1, and Lehigh Valley 100. Later models featured doors at both ends in addition to the sides; in addition, larger 100-ton versions were built. They could run in either direction, although there are distinct ends and sides: the above image shows the "B" side and "2" end (which I consider the "rear" of the locomotive). As usual, the Power Functions receiver turned out to be the biggest bugbear in this whole adventure. Its shape is extremely inconvenient. 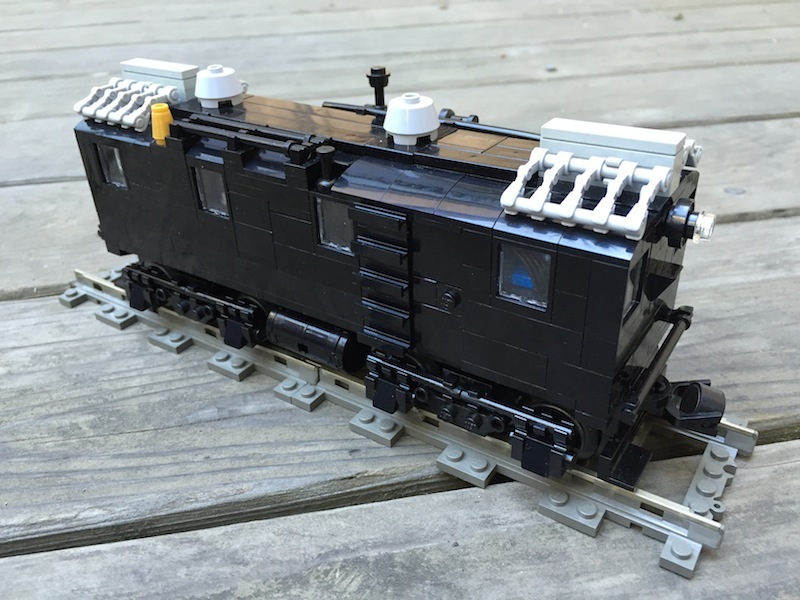 While there is just barely enough room to fit Power Functions M motors vertically inside the locomotive above the trucks, placing them would imply that the battery box would have to go between them ... leaving no room for the receiver. I was not going to accept powering only one of the trucks (for a model this light, you need all the traction you can get). The locomotive is not long enough to orient the M motors any other way, so I turned to the trusty 9V gearmotor instead. However, I determined that, even using that motor, there wasn't enough room inside the model for both two motors and the receiver. It was around this point that I decided that 7-wide was the correct width for the model, to avoid it looking too big (it also resulted in better proportions for the windows at the end of the locomotive). 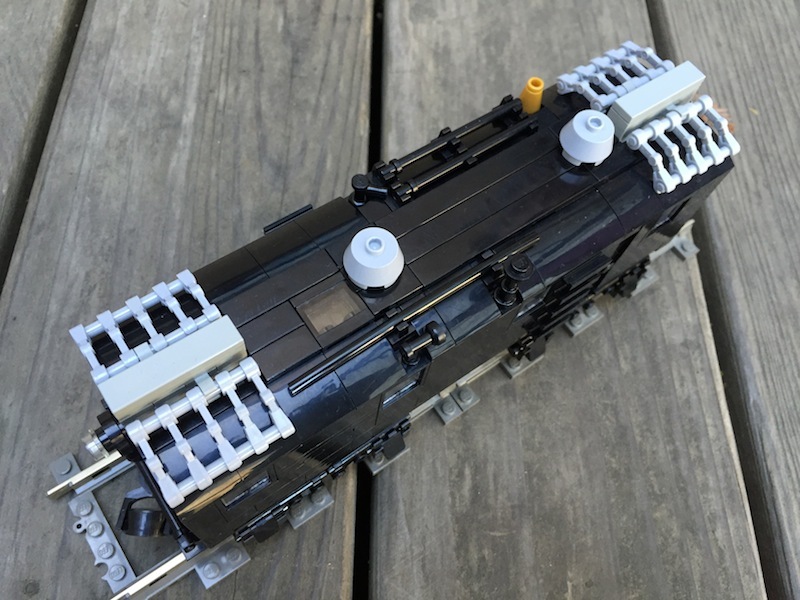 At 7-wide, there are only 5 studs of width inside the locomotive, of which 4 studs are taken up by the battery box. 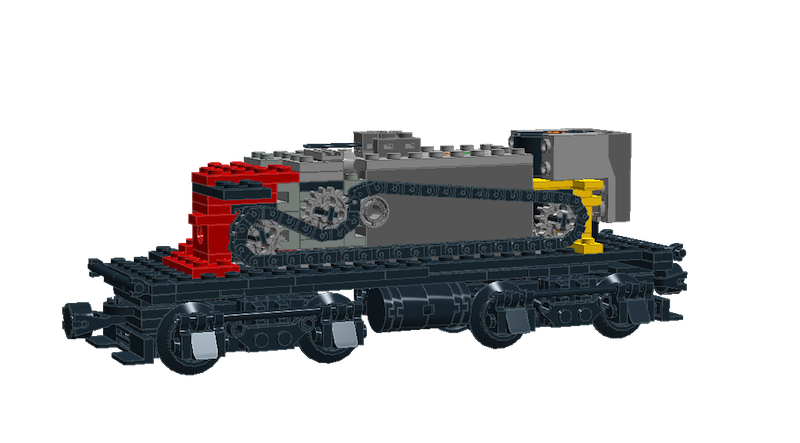 The transmission would have to either be 1 stud wide, or I would have to integrate panels into the side of the locomotive in the hopes of hiding the gearing. It is actually a pretty decent puller despite its small size (it is the "AGEIR" listed in this thread; the power rating has since risen to ~0.2W after I carefully lubricated and reassembled the entire drive system). 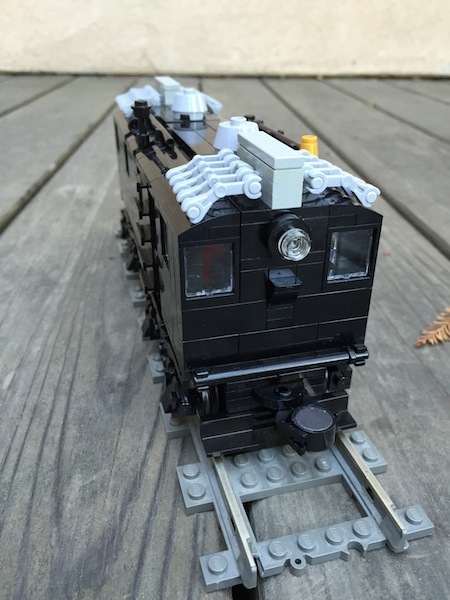 Oddly for a PF-equipped locomotive, it is possible to back-drive the motor by pushing the locomotive, due to the low mechanical resistance of the 9V gearmotor. An additional side "benefit" of the drive system is that the chain makes a pleasant diesel-like clicking/rumbling sound when the locomotive is in motion. As troublesome as all these restrictions (that I placed on myself...) were, I really enjoyed figuring out how to fit all the mechanical components into such a small space, while still maintaining an accurate depiction of the prototype. It just goes to show what's possible using Power Functions. Brickshelf gallery here. If you're curious about the history of these locomotives, you can read about them here. Wow, that sure is stuffed with gears, etc. Do you have a video of it running? Wow. Not only does it look good, it's also chain-driven! And here I was wondering what to do with my old technic mini-motor. I think I'll be putting mine in a safe place until I find a use for it. Awesome, I'd love to see a video of the transmission in action and of the train running. I like boxcabs. Excellent work. I like your chain drive solution. Have you ever considered getting into making Great Ball Contraptions too? That is a great build, you nailed both the look and the mechanicals are very impressive. Did you try the roof features in black too? I don't know what color they should be, but I would think that they should be black. Seeing the motor and gears through the window seems prototypical too. Commander Wolf and I shot some video over the weekend, but we haven't finished editing it yet. I'll post it once we're done. I actually really like the old gearmotors, since the studs sometimes make them easier to integrate. Their shape is inconvenient in a different way than PF M-motors, so sometimes they'll fit in places that that motor cannot (like this model). My biggest complaint (aside from the fact that the internal magnets are fragile -- don't drop them!) is that it has a short potruding shaft rather than the socket that the Power Functions motors have. I've been asked by some LUG members if I want to build one. Thus far the main blocker has been coming up with a good idea for a module. I thought about what color those should be, and they seem to have come in a variety of colors. The "squat pot" stacks, for example, may have blackened with age on some of the units; on others, they are copper-colored. The radiators are usually the same sort of grungy grey-black that train wheels usually wind up as. I eventually chose to make them grey to add some visual interest and contrast. Shot some video last weekend, and finished editing it now. If you listen carefully you can hear the clicking-rumbling sound the chain makes as it drives. Some of Commander Wolf's locomotives and rolling stock can be seen as well. Did you use old or new chain links? The newer ones are more prone to clicking. I ordered some new links for this project, since I didn't have any sets with chains. I borrowed some older links from a friend and they looked the same to me though. Maybe they get worn down a bit from use? Regardless, I don't find the sound to be a huge problem. Very neat and inventive drive mechanism. The build is nice and accurate - though I do find that train its based on is kind of bland looking (that's not your fault, though :D ). I wonder with gears and chains and non standard does it consume more or less PF battery power over time? Boxcabs don't have the flowing curves or prominent angles of other locomotives, but they have their own type of charm. Re: power draw: The model puts out ~0.2W of pulling power, but it's not clear how much electrical power is being consumed along the way. 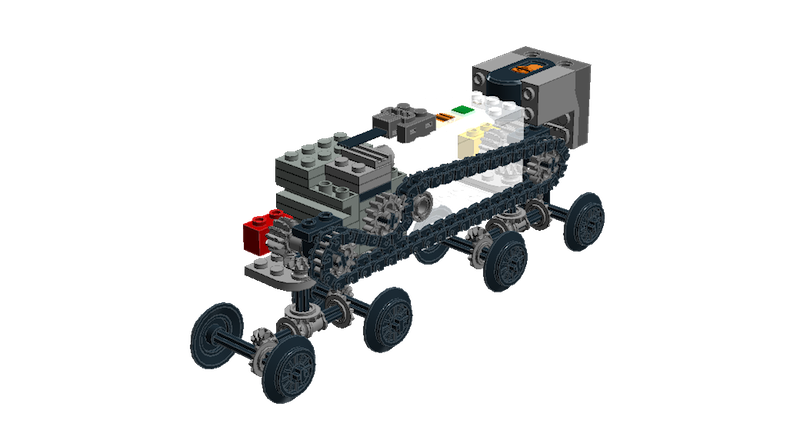 While chain drives are less efficient than other transmissions (and I have some other iffy business such as axles not being as well supported as they should), I am also using the most efficient Lego 9V motor. I wonder if I can rig up some sort of current-measuring device as a follow-up to the power-testing measurements. You have bumped a very old topic, just to say "I like it". Please don't bump old topic and please don't simply post comments as "I like it". Explain why you like it, what could be improved etc. Read the site guidelines about topic bumping and posting etiquette.